Laurie Herron has been practicing healing work for over 25 years. During that time she has developed her own unique techniques of using sound and vibration to access intuitive information from the higher self. She uses shamanistic influences and guide work in order to help facilitate transformation on the material and soul levels. Laurie has been teaching Acutonics in the greater Bay Area for since 2003 and has a private practice at the Bancroft Center of Chinese Medicine. She is senior faculty of the Acutonics® ​ Institute of Integrative Medicine LLC and is also a co-founder of West Coast Acutonics in Concord, CA. To find out more about her professional services, please click here. 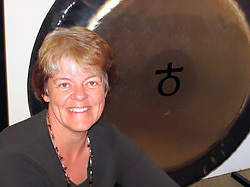 Katie Mink has been licensed to practice acupuncture in California since 1987. She is the ownder and Director of the Bancroft Center of Chinese Medicine in Berkeley, where she specializes in women's health, Acutonics, nutrition, and Chinese Herbal Medicine. Katie received her acupuncture degree from the San Francisco College of Acupuncture & Oriental Medicine. She has also practiced acupuncture in India at the Meher Free Dispensary, Avatar Meher Baba Perpetual Public Charitable Trust, Ahmednagar, Maharashtra, Inda. Katie is senior faculty and a member of the Advisory Group of the Acutonics® ​ Institute of Integrative Medicine LLC. She and Laurie Herron are co-founders of West Coast Actuonics. To find out more about Katie's professional services, please click here.